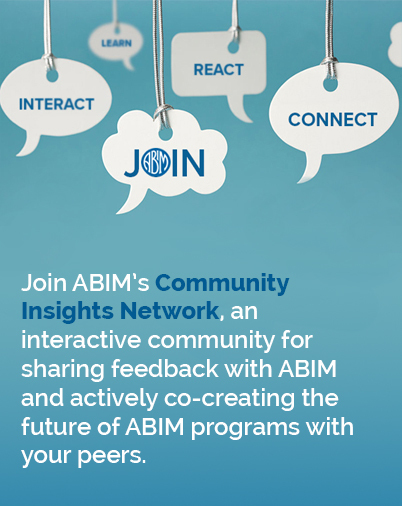 As we continue to discuss the new Maintenance of Certification (MOC) assessment options the American Board of Internal Medicine (ABIM) announced earlier this month, we wanted to share one of these public conversations with you. The long-form video above gives an overview of my May 5 Town Hall presentation with Chair-Elect Patricia Conolly, MD, and Internal Medicine Board member Yul Ejnes, MD, at the American College of Physicians Internal Medicine Meeting 2016. An overview of the question-and-answer session that followed with physicians is also included. Below are some brief clips from the presentation. You can also view these on ABIM’s YouTube channel: “Redesigning MOC” playlist. Previously, we posted the full slide deck of the “Redesigning MOC” session. I hope these videos deliver more information, answer some questions you may have and provide additional context behind our plans to offer physicians assessment options. If you continue to have questions, feel free to reference our FAQ page, and I welcome you to reach out to me with your thoughts and ideas.